Sign? What sign? I leaned forward in the minivan passenger seat to see what this apparently well-known phenomenon looks like. The sign looked dim like normal to me, but he pointed to the circle underneath the words Krispy Kreme and I saw it: the red letters announcing newly baked treats. He swung into the parking lot and three wet and sandy daughters piled out of the back of the minivan totally confused by our impromptu stop at the doughnut shop. This was not part of the plan, not on the vacation agenda, not on the list of expected activities we reviewed that morning at breakfast. They balked a little. They are tired, wet, sandy, and cold. Can they just go back to the hotel? Pleeeeeaaaaaase. We assured them…you will like this. This will make you happy. Just trust us. We are your parents, full of the wisdom and insight that comes with age. A few minutes later, they emerged wearing paper hats and carrying the box of hot doughnuts: fresh, deliciously soft and gooey, hot doughnuts. I’d heard all the hype and hadn’t believed it. How could hot doughnuts be that much better than the plain old ones I bought in a box from the grocery store? But oh my, they just melted away in my mouth. Normally, one doughnut would be enough, but these evaporated when they hit your tongue. I assured myself that calories don’t count when you’re on vacation. But there it is in my soul, as I’m chomping down on hot Krispy Kreme doughnuts of all things, the realization that it wasn’t the ingredients that were different or the baking method that made them my new favorite treat. Those doughnuts in the boxes at the grocery store were baked the same way by the same company with the same recipe. What made the difference was freshness. There was not one second of staleness as they moved from the oven right onto our tongues. And I long for this now. I think how too often I let my time with God grow stale. I come a little too complacent to His Word, a little too rushed, a little too distracted. I’m too apt to treat my time with Him as what a good Christian girl does because that’s what good Christian girls do. We have our quiet times. We read the Bible through every year. We check the box and maintain righteousness and right standing. As an elementary school girl, I used to feel flat-out guilty and sin-stained if I hadn’t read a whole chapter in the Bible before going to sleep at night. A few verses wouldn’t do. I was clearly selfish and in need of repenting for not hitting some magic holy quota. I think of my hot, fresh doughnuts and I think of the fresh-baked bread the priests laid out in the Old Testament Tabernacle once a week. Put the bread of the Presence on this table to be before me at all times (Exodus 25:30 NIV). They didn’t archive that bread and let it sit and grow moldy there before the Lord. They replaced it week after faithful week. It needed to be fresh. It needed to be new. 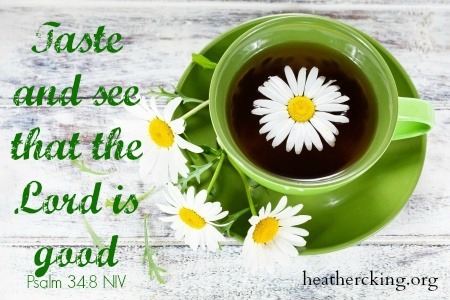 That’s what the Psalmist assures me, that when I taste, I will discover the Lord’s goodness. So, if I’m biting into what’s stale and moldy, crusted over and hard, then I’m missing out; I’m missing Him. Help me, Lord, to stop being satisfied with yesterday’s bread and start craving the freshness of Your presence. May I come into Your presence expectant instead of coming into Your presence complacent. How Many Seashells Did I Bring Home from Vacation? Oh, Heather, what a great analogy and so true of so many of us as Christians. And, oh my, I haven’t had a Krispy Kreme hot from the oven in years (sadly, or perhaps not!) there’s not one where I live. Thanks for today’s reminder of our need for God. It’s a little bit of a trek for me to get to a Krispy Kreme store where we live also, which (like you said) could be a good thing! Yum to both, hot doughnuts and fresh experiences with God!